In the early 1990s, peacemakers, politicians and researchers believed that growing water shortages would lead to an increasing number of wars and conflicts around the world. It was thought that the disputes in the Middle East would become more difficult to resolve as water resources diminished. However, views have since changed on the role of water in conflicts. Instead of being a cause of war, it can now be seen that collaboration on water – managed correctly – can become a source of peace. The idea that collaborating over a scarce resource like water could lead to improved relations is really fairly basic psychology: allowing parties in a conflict to collaborate on something practical and technical can help them to break a deadlock and lay the grounds for peacemaking. The issue of water in the Middle East has always been treated as an issue of particular importance for security policy and nation building. In recent years, however, peace brokering organisations and other parties have tried to play down and redefine the issue of water. There have been attempts to tone down the importance of politics, and technical experts have been given greater influence in peace issues that concern water. She gives the example of the planned canal between the Red Sea and the Dead Sea. It was intended as a practical peace collaboration, but the project is now at risk of collapse because insufficient consideration has been given to the political, social and environmental consequences. Under the original plan, Jordan, Israel and Palestine were to build a joint water conduit from the Red Sea to the Dead Sea, with extensive support from the World Bank and development cooperation agencies. There was great enthusiasm and high expectations. Through the collaboration, more water would be produced from desalination and energy would be generated using water power. There would be major benefits on multiple levels: the Dead Sea would be saved from drying up and Israelis, Palestinians and Jordanians would get water power and drinking water. Last but not least, this mega project would be a symbol of peace and cooperation in the region. However, the project has not run to plan. It is felt to have poor support among the local population and the environmental movement has highlighted major risks in transferring water from the Red Sea to the Dead Sea. Many people feel that it would be a better plan to rehabilitate the River Jordan, which is polluted and dry for several months of the year. 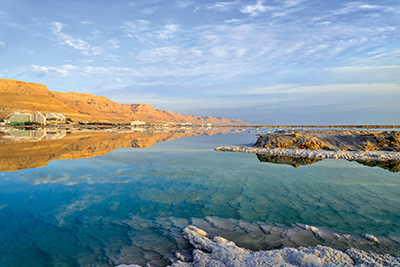 Others say that it would be more cost-effective to save the Dead Sea by building a canal to the Mediterranean. However, since the major issues around peace politics have been avoided, for instance ending the Israeli occupation, one of the core issues in the water collaboration has not been addressed, namely the rights of the Palestinians to water. Today, the Palestinians are entirely reliant on Israel to supply them with water. “This is the disadvantage when the peace process is taken over to too great an extent by technocrats”, says Karin Aggestam, who feels that the major plans for the canal between the Red Sea and the Dead Sea have not led to any significant progress in the peace process.